It was the return of the old guard as the podium places were decided on the final day of the World Championships in Prague. 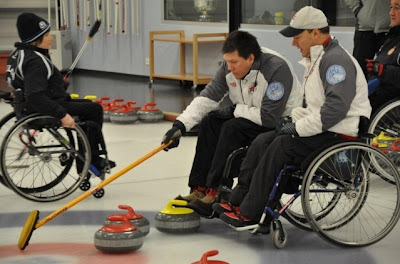 Since 2004 there have only been three winners at the World level of wheelchair curling**, and all three teams claimed the podium today as Canada won gold, Scotland silver and Norway bronze. Defending champions Canada also set a record as the only team to go through a World event unbeaten. 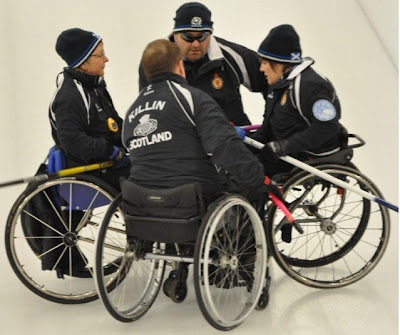 In the morning semi-final Scotland, who had beaten Norway 9-1 in round robin play, overwhelmed them 12-1, racing out to a 6-0 lead and sealing the win with a 4 in the 5th and a date with Canada in the afternoon's final. It was the first time since Canada's nail biting last rock victory in 2006 that Canada and Scotland had met in the final of a World event, and it was a close game at the beginning. Canada opened with 2 with hammer, but Scotland took a single and a steal to tie. 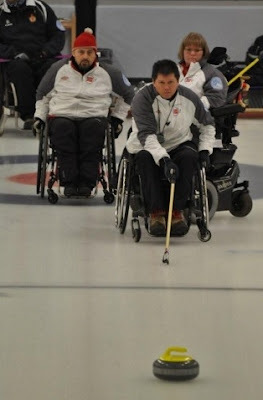 Canada regained the initiative with another 2 before the break, and then eased ahead with steals in ends 5 and 6 to win 7-3. 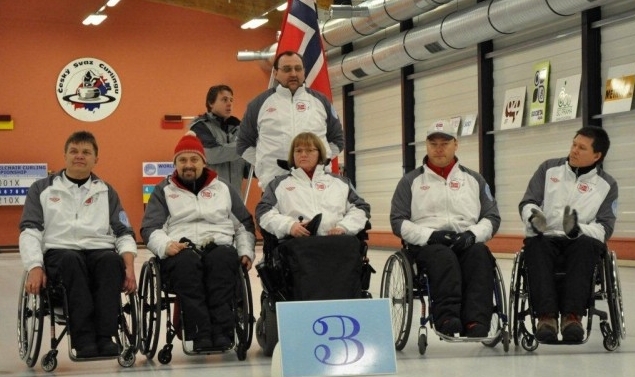 Norway had to overcome the disappointment of their semi-final thrashing by facing Russia for the bronze. Quite why the losing team in the 3 vs 4 game should get another chance at a medal eludes me, but this time justice prevailed as Norway beat Russia 8 - 3. Russia started well, stealing 2 in the 1st end, but Norway posted the next seven points for a comfortable win. 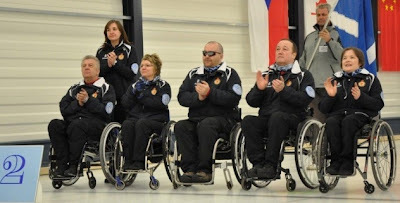 Russia join the medallists and China, Korea, USA and Sweden as automatic qualifiers for the 2012 World Championships in Chuncheon City, South Korea February 18 - 25, 2012. 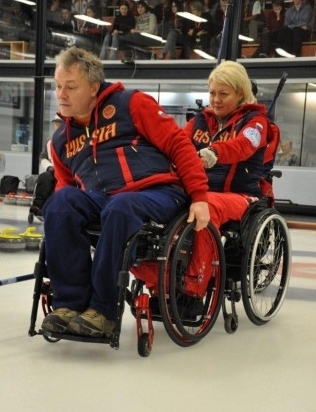 They will be joined by the top two teams competing at the Worlds Qualifying Tournament in Finland at the end of October. Only teams that compete in World Championships can earn points towards qualification at the 2014 Paralympics in Sochi, Russia. **Scotland won the Worlds in 2004 and 2005. Norway won the Worlds in 2007 and 2008. 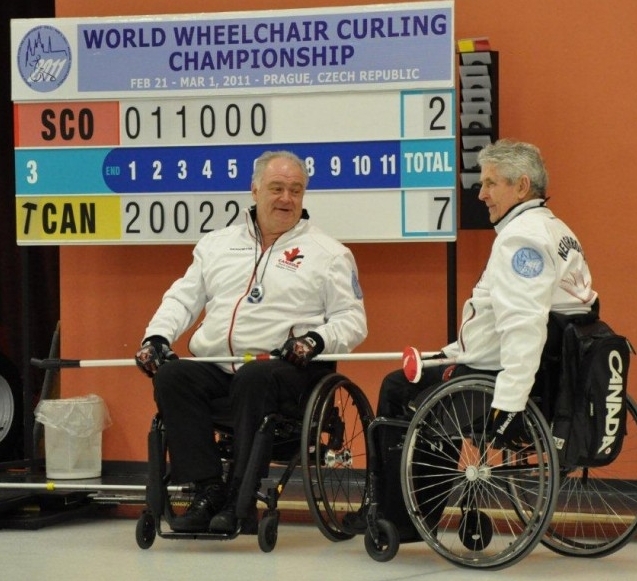 Canada won the Worlds in 2009 and 2011 and also the Paralympics in 2006 and 2010. 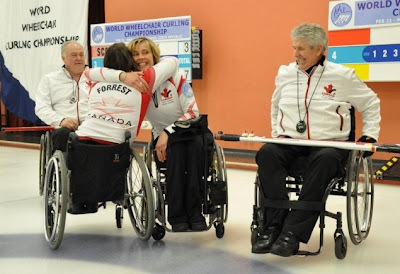 Well done Team Canada. Setting a high standard for the world's wheelchair curlers.